It is only Day Three of our brilliant Banana Diet but yesterday we told you how it has sparked bananamania up and down the land – with the fruity favourite flying off supermarket shelves from Falmouth to Fife. On Day One we told you what you had to do and gave you a selection of menus. Yesterday we printed recipes, for the mouthwatering meals that could help you lose up to 141b in 28 days with the plan from The Sun’s Slimming Editor Sally Ann Voak. Today a fitness guru to the stars shows you simple exercises to accompany our great diet. Together they will help you become fighting fit. David Marshall developed the unique Bodydoctor Fitness plan. 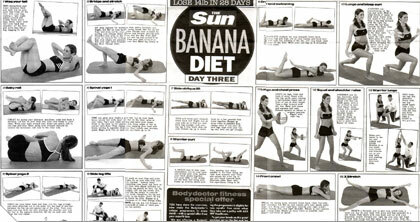 It-helped supermodel Sophie Dahl drop three dress sizes and lose more than five inches from her waist in just six weeks. And Hollywood actress Rachel Weisz, TV stars Ant & Dec and Edith Bowman, singer Myleene Klass and Premiership footballers Rio Ferdinand, Frank Lampard, Lily Allen, Russell Brand, Gerard Butler and Joe Cole also credit David for their svelte physiques. Now he has designed an exclusive 15-day exercise programme just for YOU to do at home. Over the next two pages he takes you through his routines with Page 3 favourite Nikkala. David, who has been developing fitness programmes for 27 years says: “If Sun readers follow my exercises for just 25 minutes a day they will change their body shape completely They will get long, lean muscles,their abdominal strength will improve and they will feel fit and fantastic. To get the best out of the programme, all of the exercises should be performed slowly at first. And it is vital that on every exercise your stomach is held in and kept working. This means drawing it in and down to close your ribcage. On the floor exercises your back and shoulders should be pressed into the floor as much as possible. Do just one exercise on Day One, two on Day Two and so on until you are doing 15 at the end of the programme. Each individual exercise must be performed for at least 30 seconds. That can increase to a maximum of two minutes as fitness improves. The programme will improve your muscle tone and, change your body shape. If you have the time you should supplement it with cardiovascular exercises – walking, swimming, jogging or skipping. Do this between three and six times a week for ten to 30 minutes depending on your fitness level. Remember your body thrives on movement – not inactivity. The idea is to work within a comfortable range of exertion, not to turn yourself into a sweaty beetroot. Remember a little today becomes a lot tomorrow. As with all exercise programmes, consult your doctor before starting.